New from Deb & Co.'s "FAMILY COLLECTION" , this little family is having tons of fun in the snow. 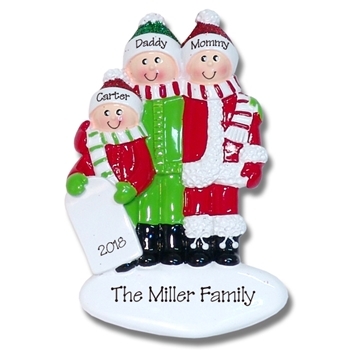 This personalized Family Ornament is Perfect for any Family of 3. As with all of Deb's ornaments, it is wonderfully detailed. There is a touch of glitter on the hats for that special sparkle. It may be easily personalized with names and a year. Designed by me, it is made from RESIN and hand painted. Comes complete with satin ribbon and hook for hanging. Available for a family of 3, family or 4 or family of 5.